Hans Rosenfeldt is one of the creators of the incredibly successful and award-winning Scandinavian TV-series The Bridge (2011-2018). The show has aired in more than 170 countries and also been successfully remade into a US version, The Bridge (2013-2014), as well as a British/French version, The Tunnel (2013). 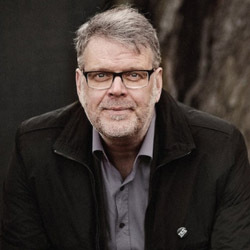 During his more than twenty years in the industry, Rosenfeldt has written, created and worked on a large variety of television and drama productions, such as Wallander (2009), Sebastian Bergman (2010) and The Sandhamn Murders (2012). His most recent work include creating and writing the Netflix Original series, Marcella (2016-). In addition to being one of Sweden’s leading screenwriters, Rosenfeldt has also found success as an author. Together with Michael Hjorth, he makes up the celebrated Swedish crime writing duo ‘Hjorth & Rosenfeldt’. As the authors behind the internationally bestselling series about psychological profiler Sebastian Bergman, their books have sold more than 3,5 million copies in over 30 territories worldwide. Worth every penny! I love everything about LSF and there’s always a great atmosphere thanks to the hard work of the team.